Rubber bumper MGBs have long been disparaged by enthusiasts, but thanks to attrition driving supply down and prices up, people are starting to recognize these for what they are – while they were burdened by the weight of safety equipment, and the performance reductions of emissions equipment, they are still simple, reliable drivers that can better withstand the beatings of a daily driver life. The latest years also benefit from improvements and refinements that make them quite capable, and if you’re unhappy with them in stock form, you can retrofit chrome bumpers to start, and also remove the smog equipment if you’re not subject to testing. 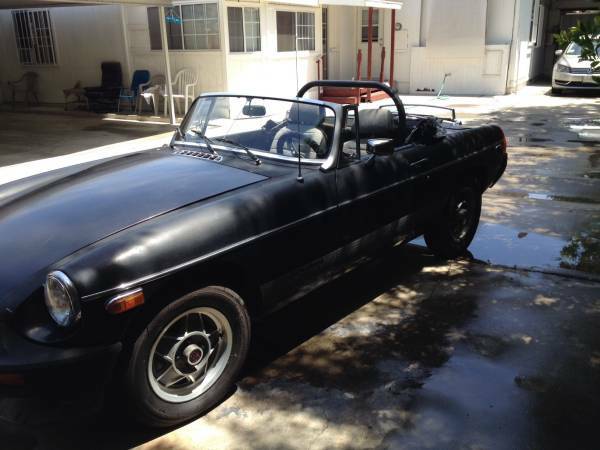 Check out this 1979 MGB Limited Edition for sale for $1300 in Bakersfield, CA. The Limited Edition cars featured silver side stripes, black paint, alloy wheels, and a front spoiler, all of which serve to hide the big bumpers and modernize the car’s looks. 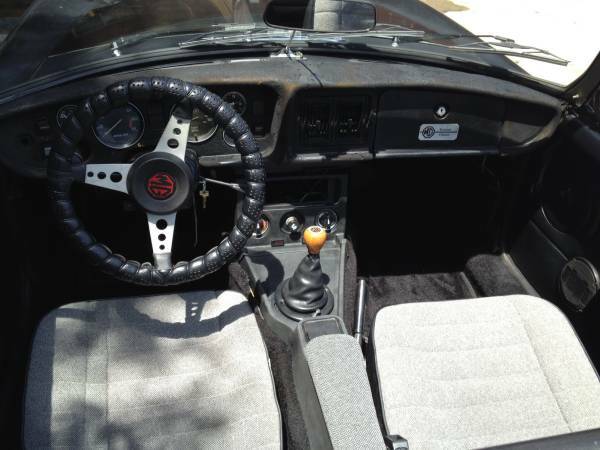 As of 1977, all MGBs got a larger radiator, upgraded alternator, updated dashboard and a zippered rear window. They also got their anti-roll bars back, which were dropped for cost savings purposes for 1975-76. 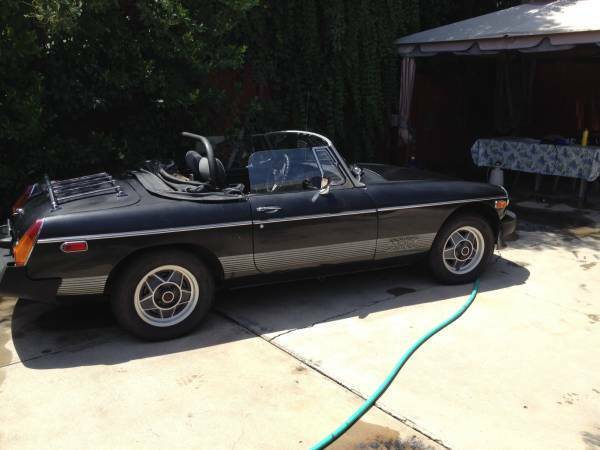 This MGB does not appear to have been registered since about 2002, and has not passed smog since 2000. Judging by the car’s condition, it’s not the body or interior that caused the long storage period. Perhaps the owner ran a smog pre-test on the car, was unable to pass, and decided to park it. The rollbar is a nice addition for safety’s sake, and while the paint is not glossy, it looks like it might take well to some careful color sanding, polishing, and waxing. Under the hood, things seem remarkably clean, and not just like it was stored for 12 years and then degreased with Simple Green and a hose. The smog pump looks like it might be new, and the SU carburetor has a nice shine on it. 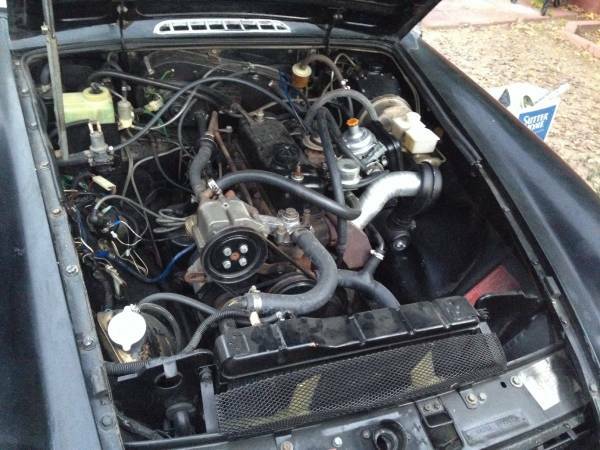 This car might be a real deal for someone who lives outside of California in a non-smog state, although with the big-bumper Bs being based on a MGB GT V8 shell, anybody could retrofit a later engine for more power and easier emissions testing. Tires are said to be new. The interior looks quite decent too, although the dash shows some discoloration or fading from the intense sun in that part of the state. No indication is given as to the condition of the top, so while it doesn’t look to be in shreds, you should expect to find a yellowed window and perhaps faded vinyl. Overall, this appears to be a fairly solid project one could transform into a respectable driver. This entry was posted on July 30, 2014 at 4:26 pm and is filed under Feature. You can follow any responses to this entry through the RSS 2.0 feed. You can leave a response, or trackback from your own site. The ad was flagged; this doesn’t seem to be the kind of ride a scammer hustles suckers with. Someone wanted the deal for themselves.